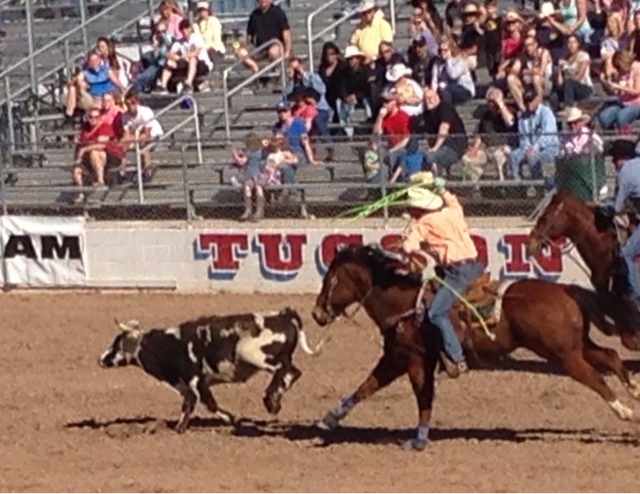 This is my third year of travels and wintering, in part, in Tucson, but it the first time I've been to the Rodeo here. 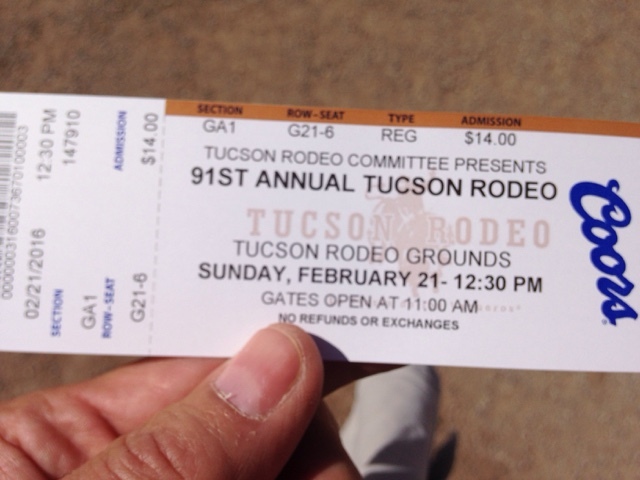 The Tucson Rodeo has been suggested previously to me, unfortunately it didn't fit into my past traveling schedule. This year I'm here for it and I decided I would attend. 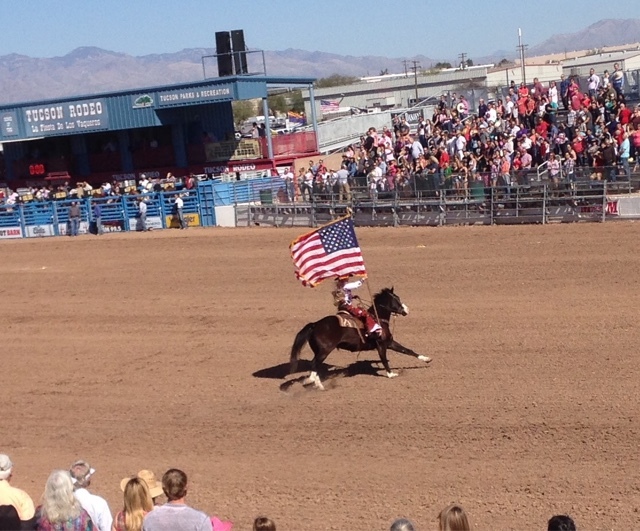 The rodeo started this past Saturday 2/20 and will continue through next Sunday 2/28, with their parade on Thursday. 2/25 at 9:00 am. Today is Sunday, 2/21 (Day 49) and it costs $7.00 to park and $14.00 for general admission. I asked one of the seat attendants and he suggested the seat I got as it is across the stairs from the $24.00 seats and I can see the blue shoots/gates for the bull riding. In front of me are where the riders come out. 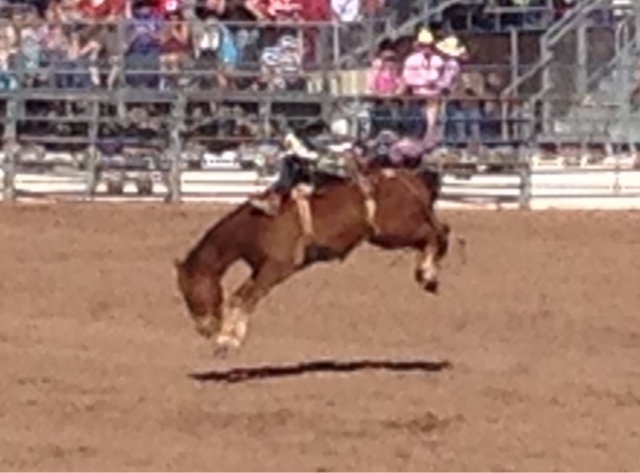 I zoomed in and digitally expanded the shot to catch this bronco with the 4 hoofs off the ground and the rider thrown back with his boots above the horses shoulders and his head on the hind quarters. This is the team roping competition. The rider closest to me with lasso in the air will catch the head and the second rider will lasso the hind legs and take the steer down. Well, that's the plan. Not all accomplish it. I liked this shot with the lasso in the air getting ready for the throw. 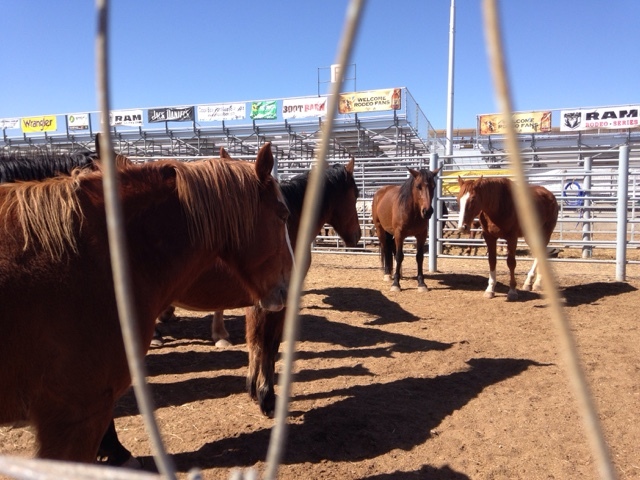 Horses corralled to be used in the rodeo. 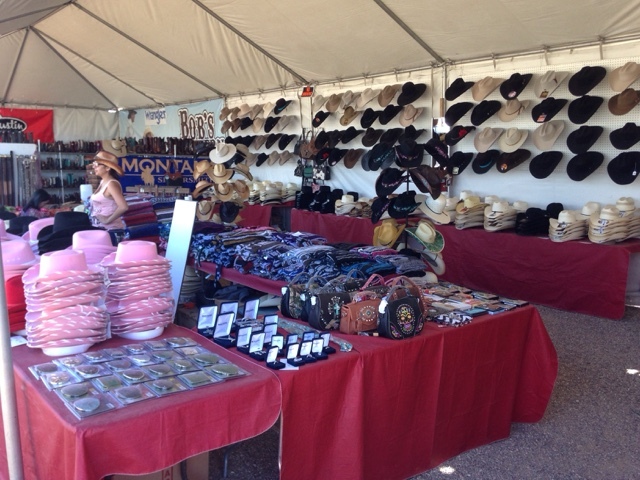 There were all kinds of vendors selling western gear. Cowboy hats and boots were popular. I didn't realize how stiff the hats were. Yes there was bull riding, bronco riding, woman's barrel race but a lot of the action was at some distance and I didn't get good enough shots I would have wanted to share. 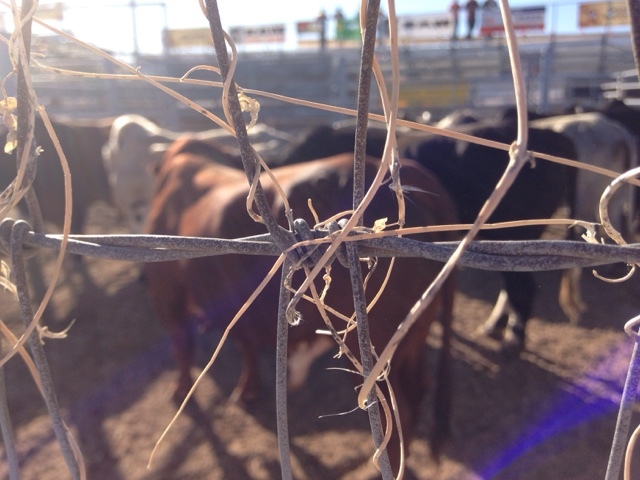 It's been a very long time since I've been to a rodeo and I had a good time, although a bit warm in the upper 80's and in the sun. There were kids events at 12:30 where the younger children ride sheep and the older takedown a goat that is tied. They ride out, get off the horse, takedown the goat and tie the legs. Team age girls ride horses around the barrels like the older woman do. 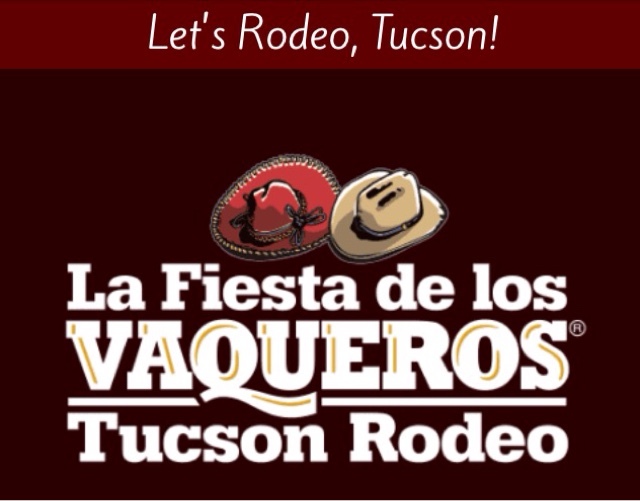 The Tucson Rodeo Parade is Thursday Morning and the top placers on each event will try for prize money next Sunday. Remember when you took Clayton and I to the rodeo back when we were kids and that bull jumped over the wall in the Centrum and into the stands? Luckily no one was there to get hurt from the bull, but I remember how awesome that was.